Liam Scanlan was three weeks into a marine biology degree when he had an idea for a new venture. He realised being a uni student working limited shifts left him with little money to spend on fashion. And t-shirts being $50-$60 a piece was completely unsustainable. Liam set to work and began scribbling simple designs for men’s t-shirts under the brand Eat Your Water. The brand aims to build awareness of social issues surrounding our oceans. After the first year, Eat Your Water built an Instagram following of more than 20,000 users and their unique t-shirts were offering customers a far more affordable and appealing product. Now Eat Your Water’s following has grown to more than 45,000 users and the company is shipping t-shirts across the world. Liam has since changed his undergraduate degree to a Bachelor in Business Innovation and Entrepreneurship. 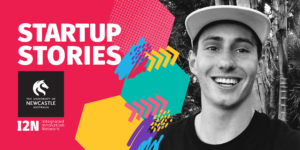 Join us at Startup Stories to hear from local founder Liam Scanlan and his story so far riding the wave of retail entrepreneurship and ocean sustainability.